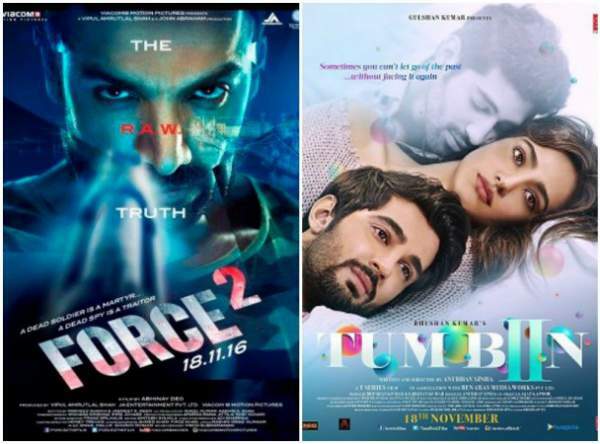 Force 2 vs Tum Bin 2 6th Day Collection Opening F2 & TB2 1st Wednesday Box Office Business and Occupancy Report: The latest Bollywood movies Tum Bin 2 and Force 2 released this Friday and started on a low note. It’s the result of demonetization. However, John Abraham’s film is leading ahead of Neha Sharma’s movie. Both the flicks are the sequels of their respective franchises. On the one hand, Force 2 follows the story developed in its prequel. On the other hand, Tum Bin2 has entirely different from its original one. TB2 is made in the same genre ( an intense love story) of its prequel. Both the prequels were hit movies, nd their sequels were obvious. The makers had already got enough publicity and thus a lot of hype was built around these flicks. Good promos attracted, even more, eyeballs. Thus, a lot of expectations came up expecting to receive a good box office opening. But, the reality proved to be harsh and miles away from the expectations. The John Abraham and Sonakshi Sinha starrer released on more than 1800 screens in India only. Force 2 got a wider release than TumBin 2 and thus, was able to get better opening occupancy. Due to demonetization problem, the business of both the movies got affected. Both got poor advance bookings and thus average openings. Both got poor advance bookings and thus average openings. Force 2 got just about 15 t0 20 percent occupancy. Directed by Abhinay Deo, the film has got positive word of mouth on its first day and thus is expected to increase its business over the first weekend. The early trends show the flick earning around Rs 5 crore domestically. With Rs 5 cr, it will beat the income record of its prequel which earned Rs 5.05 cr at the Indian box office only. While, the film TumBin 2 starring Neha Sharma, Aditya Seal, and Aashim Gulati witnessed a poor start in the morning. It got 10 to 15 percent occupancy on an average. TB2 got mixed responses and thus, it will completely depend on how its word of mouth goes. T-Series produced this romance drama with a budget of just Rs 12 crore. The film has earned a significant amount with the sale of its music and digital rights. The early trends suggest that it will rake in around Rs 3 cr in India. Rock On 2 which released last week suffered badly due to demonetization. Thus, the trade analysts had doubts on the new releases due to the same reason. However, the early trends showed that the effects of demonetization are less on the new releases as compared to Rock On 2 starring Farhan Akhtar and Shraddha Kapoor.